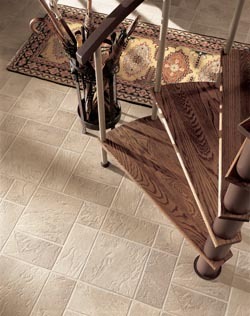 Improve the value, function, and aesthetic appeal of your home with luxury vinyl flooring. At our residential flooring store, we make upgrading the flooring on your property into a simple and stress-free experience. You deserve a beautiful and resilient floor at a price that works within your budget. For this reason, we do away with the usual “smoke and mirrors” from other stores to bring you honest service. As a result, you can outfit your home with new, discount-priced luxury vinyl tile in Colorado Springs, CO.
A house is not a home unless it is lived in, and that includes being able to let your pets be a full part of the family. Manufactured materials such as LVT have the durability to put up with the daily abuse of life. Not only is it ideal flooring for high traffic areas, but it has the fortitude to stand up to the little scratches and nicks that animal paws inflict. Next time you see your pet running joyfully to you, you won’t have to worry about what damage their nails might be inflicting, so you can enjoy life a little more. LVT floors—a popular form of resilient flooring—is a designer option that allows you to attain the stately and refined look of “premium” materials at a sensible price point. Vinyl is a polymer material that can be manufactured to mimic the appearance and texture of other high-end materials, such as stone, porcelain, and even hardwood. As a result, you improve the appearance of your interior while making it easier to clean and maintain. Choose from luxury vinyl floor tile or luxury plank flooring to achieve the aesthetic you want. Vinyl is composed of many tough, non-porous layers and a protective coating. Naturally, this allows vinyl to resist spills and stains with ease. As such, it is a great option for high-traffic areas, such as kitchens and bathrooms. Better yet, this material is easy to clean. Simply use an approved cleaner and a mop, and your investment will look just as new as it did when it was first installed. Resilient flooring is also the choice for homeowners who have pets. We all love our furry little friends, but we do not like the damage their paws do to our flooring. Before you decide to put them out in the cold, consider the advantages of choosing vinyl flooring or other resilient options. If dust and dander are leaving you with red eyes and a runny nose, you may think there is nothing you can do, but there is a solution. Your flooring plays a large role in how easy it is to keep your home free of allergens and other particles. If you want beautiful flooring that is ideal for allergy sufferers, look no further than luxury vinyl floor tile. This flooring provides a relatively smooth surface for dust to settle on. You don’t have to worry about particles becoming trapped or hard to pick up. With vinyl, all you need to do is go over the floor with a dust mop to pick up the majority of the allergens in your home. Cleaning becomes easier and allergic reactions become less severe when you make vinyl part of your fight against allergies. We all want beautiful flooring in our homes, and few flooring types are as stunning as hardwood floors. However, hardwood isn’t suited for every room of the home because it doesn’t handle moisture well. Homeowners who want the style of this wonderful flooring shouldn’t despair though, because luxury plank flooring provides you with exactly what you need. Vinyl is completely waterproof, shock absorbing, and built to stand the test of time. No matter what room you want to put it in or what applications you desire, vinyl planks are up to the task of enhancing your home’s look and value. Don’t let the threat of spills and moisture stop you from getting the interior you want. With luxury vinyl plank, you are free to give your kitchen or bathroom the distinct ambience of hardwood flooring. Thanks to state-of-the-art manufacturing methods, vinyl planks may be produced to mimic the appearance and texture of many popular wood types, such as cherry, oak, and redwood. On top of that, luxury vinyl plank can be specially made to impart unique grain patterns and textures for a distinct look. When you shop with us, consider your project as good as done. Through our Preferred Installers list, you can choose experienced and skilled installers who offer a minimum of a one-year installation warranty. We are happy to connect you with several of our installers to get more than one estimate for your project; you can then hire the one that best fits your flooring needs. Best of all, you pay the installer of your choice directly. There are no “middle man” charges to be paid. In addition, no payment is required until the job is completed to your satisfaction. All of our suggested installers are reputable and meet our high standards for customer service. Take advantage of working with us for your new flooring needs. We are with you every step of the way—from selection to design to installation. Contact us today to explore your customization options with luxury vinyl flooring. We proudly serve customers in Colorado Springs, as well as Monument, Palmer Lake, Security, and Widefield, Colorado.